Thanks to readers who have already donated to help Deepana. The current total we are aiming for, to Pay for her 3 year State Nursing course is 4,000€. Please donate something even if it’s just 5 Euros/6 USD. It all helps and is very much appreciated. Thank you, g.
Have you ever heard of the terms parametric and geometric continuity? Perhaps even used them interchangeably? Whilst they are similar concepts, there is a difference. and I will show you that difference. The two surfaces with the darker yellow shade are overbuilt and trimmed back and fillet (blend) surfaces eat away even more of it. notice the boundary locator is green at curvature continuity (C symbol) which indicates we have G2 geometric continuity. this is what we care about most of the time. Now notice the cv’s (the red X’s) and you will see there is a kink at the join, the way the cv’s of two surfaces line up with each-other is called parametric continuity and here we have only C0 parametric continuity or position. is it desirable? does it mean the surface structure (cv distribution) is too strained? this is up to the modeler to decide depending on every situation? Just know the difference; that it exists and what it is. To Learn Alias Automotive to Industry entry level has been made easier. Why not visit my website and take a look for your self? I am a top flight Alias Trainer/Modeler, specializing in taking students who are either currently studying or who have left college/university and want to learn the skills they need to reach Alias Automotive Entry Level. I offer the best value Alias training deal out there! (Your work will be reviewed every 15 days and you will receive : feedback, instruction, tips and advice from me personally, modeling demonstrations from me on your .wire and I will supply Meshes to help you with difficult areas of your model). 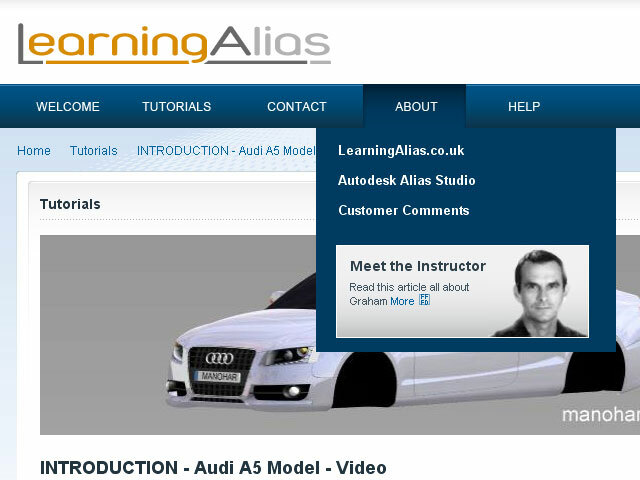 with contract modeling, teaching one to one students from all 5 continents and now of course my brand new website has gone live and it is possible to learn Alias Automotive to a professional level for the lowest rate on the planet. 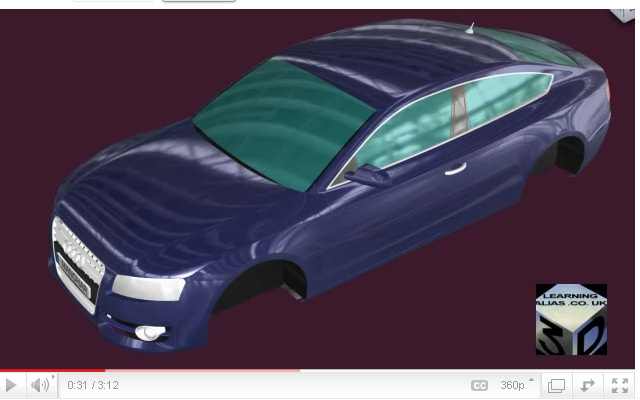 Pictured below is an Audi A5 Sportback built by one of my students who is now a Digital Sculptor for GM. I am now putting some of my tutorials on YouTube, so whilst you’re there you may wish to check them out. There’s a full tutorial on how to create a Ball Corner to Class A Surfacing, Catia V5 spec. For student’s who have the objective of finding a CAD job in the near future, I still teach One to One students and all of these students get Automotive Modeling or Design/Modeling jobs, so it’s a great investment to make. Many of my students make it to the top and succeed in becoming pro. Alias Digital Modelers. The hourly rate is very high and there are vacancies in UK. France, Germany, USA, Brazil etc. On my website I teach you how to build the models you need to get accepted at interview. Why not take a look? 167 Euros (200 USD equivalent Nov.2011) per month. You get your .wire reviewed by me every 15 days and you will receive : feedback, instruction, tips and advice from me personally. Access to all videos including my ” Private Student Training Videos”. You will build at least 3 complete automotive exteriors. The course also includes an intensive Reverse Engineering section, which required by most employers. We use the Evaluation Shader Princ. Max to view the consistency of the blends curvature. We have a plane for each xsec. This student will be starting her first Automotive Alias Job soon. She loves detailing and just to show-off she is modeling this Winter Tire. There are 2 more rows of tread still to be added at the edge of the tire. I have just received these additional pics. which is beautifully modeled and gives a much more interesting form to the tire. Many of my students make it to the top and succeed in becoming pro. Alias Digital Modelers. The hourly rate is very high and there are vacancies in UK. France, Germany, Italy, Spain, Sweden, USA, Brazil etc. To Learn Alias Automotive to Industry Entry level has been made easier. Please donate just 5 Eur/6 USD. Why not take 2 min to do it now? Learning Alias sponsors the Education of children in Nepal. This is Deepana and we need to raise money to put her through Nursing College in Kathmandu. Learning Alias Blog is a free service, but if you would like to show your appreciation, please make a small donation. 100% of your money will go directly to pay Deepana’s college fees. Without the help of sponsors in the developed world, Deepana would receive no education whatsoever, as she comes from a remote Hymalayan village. Thank You, graham bullock. This is one of the current projects which I am working on with my Advanced Students. It is a class A Fully blended C Pillar built in single span with very neat CV hulls and max gap tol = 0.001mm. This project is completed working to tight tols. The spec is max. gap < 0.001mm. with the more experienced students working to Catia V5 max. gap =0.001 mm.